A furious Thai airport worker stopped a tourist from flying in an angry row over hand luggage that was 0.4kg over the limit. The Chinese tourist arrived at the boarding gate for his flight home at the Don Muang International Airport in Bangkok, Thailand, yesterday (February 13). But the women at the NewGen Airways boarding gate demanded to weigh his case – which was allegedly found to be 5.4kg. This was over the airline’s 5kg carry on allowance. Angry scenes followed when the pair were seen standing over the scales as the man refused to pay extra to have the case checked-in and would not remove any of the belongings. 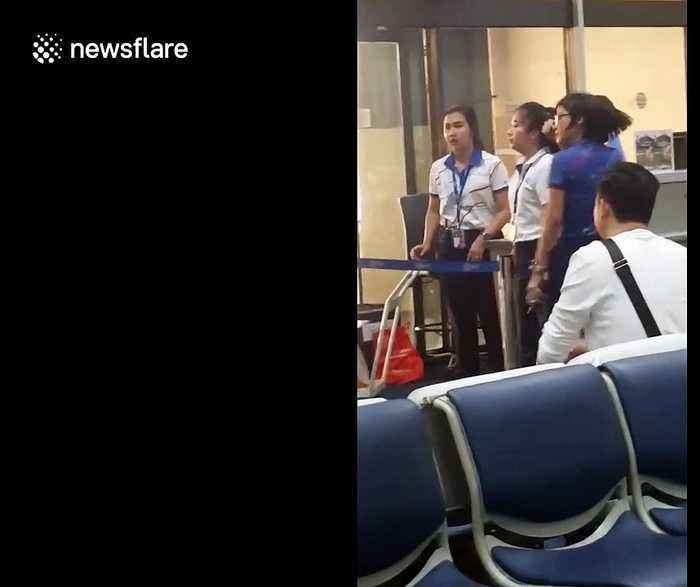 Mobile phone footage from another shocked airport user shows how the Thai desk worker repeatedly yells at the tourist and tells him he will have to stay in the airport. She’s heard saying: ''If it's not OK, get out. I’ve been talking to you for 10 minutes already, why don't you do it?'' Some witnesses blamed the Chinese tourist for causing the argument by not following the weight rules while others accused the worker of being unprofessional. They said the row started when the airport worker refused to let the man board the plane with his overweight case. However, the airline today apologised for the incident. A spokesman for NewGen Airways said: ''We sincerely apologise for the inappropriate behaviour of our officer.